Let outdoor lighting light up your night! We love our gorgeous flowers and other landscaping features, but they all seem to disappear at night. All the hard work and careful planning that went into their arrangement and installation might even seem like a waste if you can only see it when the sun is out. Thankfully, we’re here to show you the solution. Adding a little outdoor lighting to your yard will keep your yard looking its best no matter what time of day or night it is. Are you ready to learn more about outdoor lighting? Let’s go for it. When you choose to invest in outdoor lighting, you can rest easier at night. Making the trek through your back yard to find the dog won’t result in a blind stumble anymore. 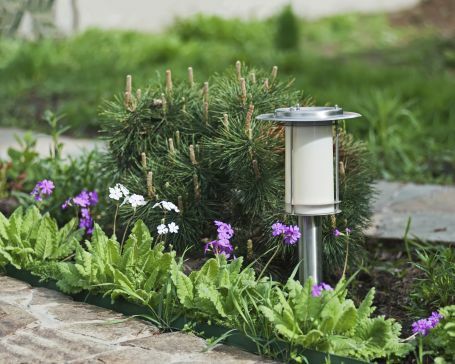 If you have outdoor lighting that lines your pathways, you’ll be able to get around without worrying whether you’re heading inside with groceries or simply taking a walk. Keeping the night lit will simply make getting around easier and safer. Installing outdoor lighting doesn’t have to lead to a larger energy bill. In fact, you can utilize the power of the sun to keep your lawn lit up at night. How cool is that? Solar power’s popularity is on the rise and you can take advantage of it quite easily. Creating scenes in your garden or other landscaping features is a great way to spruce up your yard. You can make this a reality by investing in small lights that will feature your favorite areas. If there’s a flower or small statue that you’d like to highlight, a lamp can help you do that. Do you have more questions about outdoor lighting? We can help! This entry was posted on Sunday, June 14th, 2015	at 11:54 pm	and is filed under Blog	. You can follow any responses to this entry through the RSS 2.0	feed. Both comments and pings are currently closed.